Say hello to my favorite ways how to wear lace tops this year. This pretty top can be worn in different ways. This gorgeous ethereal fabric will easily give you a feminine look. Lace is one of the biggest trends on the horizon. It can be spotted everywhere around, starting from runways to the streets of big cities. Many ladies are intimidated by lace tops because they feel like they show off too much skin. To tell the truth, lace shows off only some of your skin, plus it’s a versatile fabric that can be worn in many ways. I’ve rounded up my favorite fashion tips and look to help you rock lace tops. All you need is to scroll down and see the easiest outfit formulas to try on this year. Here we see a lovely outfit for chilly days. 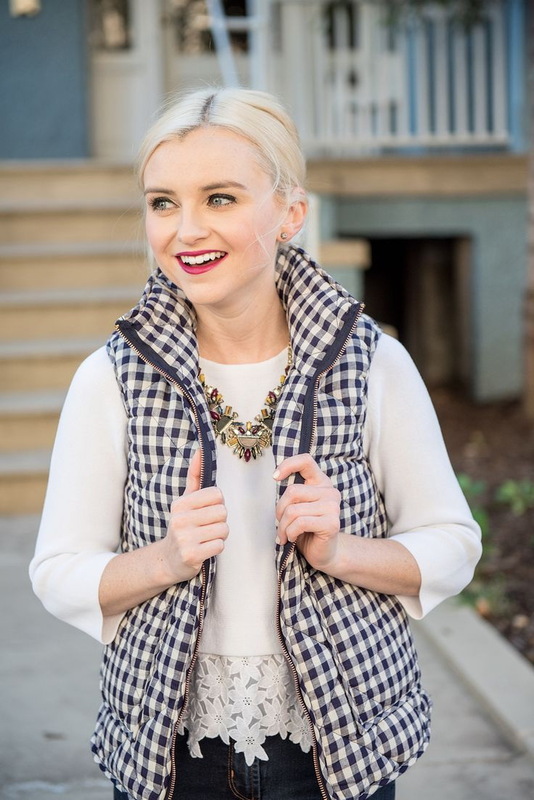 Blonde appears in a gingham white-blue puffer vest worn atop white long-sleeve top embellished with lace detailing. I am in love with that chunky necklace in golden metal. What brand is that lace long-sleeve cropped top that Karlie Kloss is wearing?